Most genomic studies require multiple testing of the same sample to identify specific allelic variants or mutations. A typical workflow consists of a very fast and only partially informative primary screen followed by a secondary targeted analysis to corroborate the findings. One example consists of genetic studies aimed at identifying mutations in specific genes. Usually, the first step is a non-sequencing test to detect variants in the genes of interest (e.g., by multiplex ligation-dependent probe amplification), followed by targeted sequencing of the samples that are positive in the first assay. The downside of this procedure is the need of large quantities of DNA since it requires by default more than one reaction per sample. 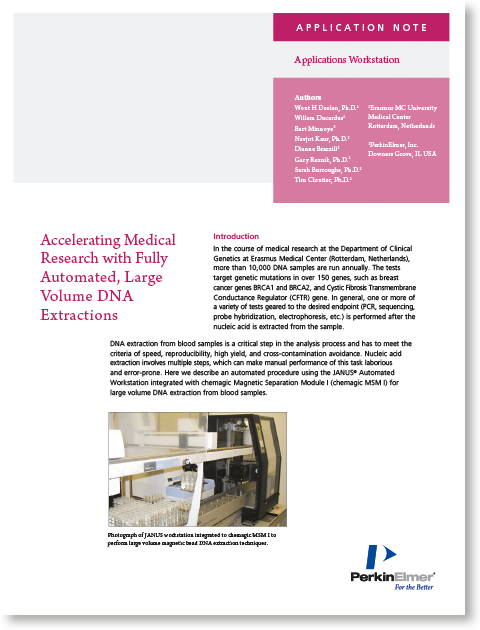 Efficient high-throughput extraction of high yields of DNA from primary samples is, therefore, a key requirement for the successful setup of these genomic workflows.